We’ve got a lot to get to. Like, a lot. Like most WWE pay per views these days, this thing went way too long. So let’s just get right into it. Royal Rumble 2019. Let’s go! Bobby Roode and Chad Gable def. Scott Dawson and Rezar. I was in and out during this match. I know Akam is out healing from an injury. But why was Rezar teaming with Dawson? Shinsuke Nakamura def. Rusev to win the WWE United States Championship. I only caught the finish to this one. Can’t say I saw this coming at all. Nakamura may have been relegated to the pre-show a year after his big Rumble Match win. But at least he can say he won a title. Buddy Murphy def. Hideo Itami, Akira Tozawa, and Kalisto to retain the Cruiserweight Championship. I got this one wrong too. I called Itami. Nothing wrong with keeping it on Murphy, though. I had the audio of this match on in my car. And I just kept hearing those kicks. I know they’re worked, but those smacking sounds are enough to make your skin crawl. Asuka def. Becky Lynch to retain the Smackdown Women’s Championship. Really good start to the show, which included a nasty fall to the outside. Mrs. Primary Ignition actually came in to check on me, as I let out an “ooo” when that happened. Shane McMahon and The Miz def. The Bar to win the Smackdown Tag Team Titles. Shane really went all out in this one. That leap from the top on to Sheamus, then going straight into the uppercut from Cesaro. The Coast to Coast into the Cesaro Swing. Then finally, the Shooting Star Press for the win. Really happy that they brought Miz’s dad in, and that he’s part of this story. I’m enjoying this Miz/Shane thing for what it is. Ronda Rousey def. Sasha Banks to retain the Raw Women’s Championship. I’ve totally lost track of where ___ the human being begins and the character of Sasha Banks takes over. But either way, regardless of my personal critiques of her attitude, Sasha showed us why she’s one of the best in the world. Not just because of her wrestling, but her character work. She and Ronda brought a great personal intensity to the match. Her facial expressions, the bending of the fingers, a la Pete Dunne. Plus, her borderline sore loser mentality after the match. I wanted her to pull a Jericho/Nakamura style heel turn. 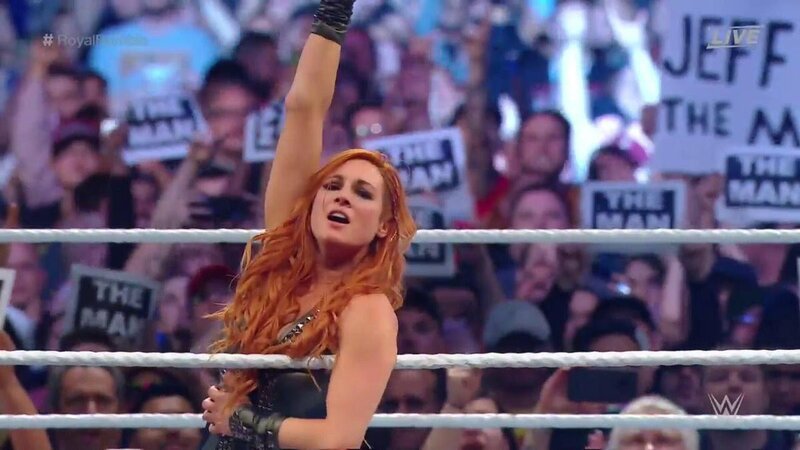 Becky Lynch won the 2019 Women’s Royal Rumble Match. – Nice spot for Lacey Evans. It allowed her to do some introductory character work, at least for the mainstream audience. – Very few eliminations early on. Do they feel like they need to have more women in there to maintain the audience’s attention? I think this match needed more stories. More rivalries. It felt like we were longing for something to sink our teeth into. Case in point, after the Mandy Rose/Naomi stuff, we went straight into Maria Kanellis and Alicia Fox fighting over a hat. – I’m not nearly as familiar with names like Nikki Cross or Rhea Ripley as I should be. But I’m becoming a huge fan of both really quickly. Each has such presence and energy. – Good use of the Riott Squad after Ruby’s entrance. Has that ever been done before? The faction picking people off from the outside? Really made the group look formidable. Daniel Bryan def. AJ Styles to retain the WWE World Heavyweight Championship after interference by Erick Rowan. You know who I really love? Angry Daniel Bryan. He’s incredible. Needs new music, though. It’s not always the most thrilling thing in the world to see two guys work a body part like Bryan and Styles did here. But between Bryan’s viciousness, and the way Styles sold it, they made it work. I can’t say I was ever bored. That being said, the placement of this match didn’t do it any favors. After an hour-long Rumble Match and Becky’s big win, we were all coming down. It’s what smarks often call the “death spot” on a card. So Erick Rowan is Daniel Bryan’s muscle, eh? Can’t say I expected that. But he’s got the big beard. So he at least looks the part. Let’s see how they pair together. Brock Lesnar def. Finn Balor to retain the WWE Universal Heavyweight Championship. Really good match. Maybe the match of the night. The formula was what you expected it to be. Balor defies the odds to make us believe he can beat Brock, only to have Brock pull it out in the end. But they really went all the way with it here. Balor had the majority of the offense in this match, with that corner-of-the-table spot adding that precious element of believably. They made it look like Balor spooked Brock. Thus, even in losing, Balor comes out better than he was going in. 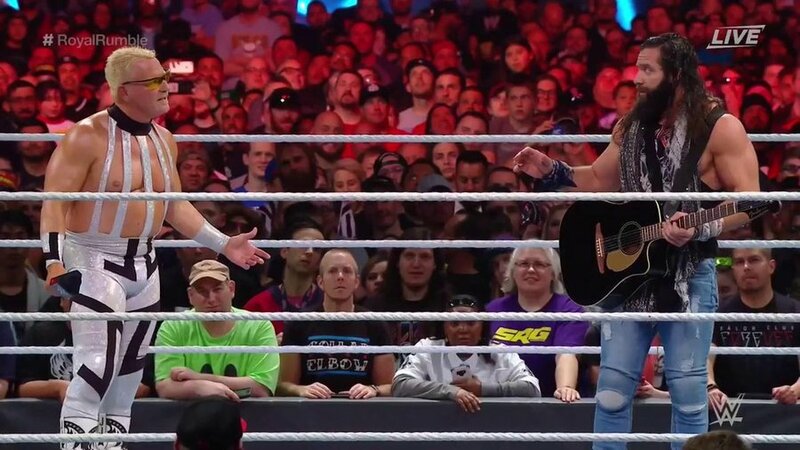 – The Rumble Match kicked off at about the point the show should have ended. Mind you, I was still excited for it. But it’s been said a million times, and it needs to be said again here: These shows are too damn long. – Really cool moment for Jeff Jarrett, coming out at number two. Nice little nostalgia moment. I was actually hoping they’d do the duet. They’ve never done that to kick off a Rumble before! Elias didn’t exactly endear himself to old school fans here. But Jarrett put him over. At the end of the day, it was the right thing to do. – Didn’t expect Kurt Angle to be in and out so quickly. And he went out with such a whimper. Great to see him. I just wish we could have seen more. – While Johnny Gargano and Pete Dunne were more than suitable NXT entrants in this match, this big one for my money was Aleister Black. Out of those three, I expect Black will be on the main roster the soonest. Eliminating Dean Ambrose certainly didn’t hurt his case in that regard. – While he was a dark horse pick at best, I wouldn’t have minded seeing Mustafa Ali take this match. He’s got all the talent in the world, and nobody would have seen it coming. His elimination of Samoa Joe was a nice moment. – Surprising to see Dolph Ziggler in this thing. Much less as the guy to eliminate Drew McIntyre. Rumor has it he’s got one foot out the door. Maybe they want him to put McIntyre over one more time before he goes. – This match wasn’t as suspenseful as last year’s. But as with the women’s match, the right person won. Congrats to Seth Rollins! Follow Primary Ignition on Twitter, or email Rob at primaryignition@yahoo.com. This entry was posted in Wrestling and tagged AJ Styles, Akira Tozawa, Aleister Black, AOP, Asuka, Authors of Pain, Becky Lynch, Bobby Lashley, Bobby Roode, Brock Lesnar, Buddy Murphy, Cesaro, Chad Gable, Daniel Bryan, Dolph Ziggler, Drew McIntyre, Elias (WWE), Erick Rowan, Finn Balor, Hideo Itami, Jeff Jarrett, Johnny Gargano, Kalisto, Kurt Angle, Lacey Evans, Mustafa Ali, Nia Jax, Nikki Cross, Pete Dunne, Rhea Ripley, Ronda Rousey, Ronda Rousey vs. Sasha Banks, Ronda Rousey WWE, Ruby Riott, Rusev, Rusev Day, Sasha Banks, Scott Dawson, Seth Rollins, Shane McMahon, Sheamus, Shinsuke Nakamura, The Bar (WWE), The Miz, The Revival, The Riott Squad, WWE Cruiserweight Division on 01/27/2019 by primaryignition.